This article is a collection of all the articles on Chinese grammar that we’ve published here on this site. In this article we’ll explain what counts as so-called “Mandarin Chinese”, how many dialects are spoken in modern China, what the Chinese writing is and the word in Chinese; how Chinese phrases are usually structured will also be explained. In the final analysis, we’ll jump into the language, starting with personal pronouns, the numbers 1 to 10. To conclude we’ll explain how to ask questions and make simple negations. Click here to read the article on the general characteristics of the Chinese language. In this article we explain a class of grammar that we don’t have in the Italian language: so-called classifiers (as sinologists call them) or numerators (as Japanese linguists call them) that are there, even with differences, much more so in Chinese than Japanese. In brief, classifiers (in Chinese) are inserted between the number and noun so as to formulate the numeral or quantitative constructions (10 pens, 5 books, etc). For each class of nouns there’s an appropriate classifier that unfortunately you need to know and study. Click here to read the article on classifiers. In this article we explain the adjectives in Chinese and why they are commonly designated as predicative or attributive. They are called this because they have the intrinsic value of the predicate (the verb “to be”), so all adjectives aren’t simply translated with “tall”, “short”, “skinny”, “fat”, but rather with “to be tall”. “to be short”, “to be skinny”, “to be fat”. In this article we also explain how to negate the adjectives, how to form questions through adjectives, how to connect two or more adjectives, how to express a change in time and how to use adjectives in the role of adverbs. Click here to read the article on predicative adjectives. In this article we speak about a characteristic structure of the Chinese language, the “determining – determined” structure. The determining is what determines, specifies or characterizes something else, the determined. For example, in the syntagm “I like delicious food”, “delicious” is determining the “food”, because it tells us a characteristic of the determined “food”. At times, the determiners can be actual phrases that are separated by the determined by a comma. In this article, we introduce the particle of determination 的 (de), how it is used to make relative propositions. Click here to read our article on the particle of determination 的. In this article we explained what directional complements are (inside, outside, to the side of, in front of, behind, to the right of, to the left of, above, below), as well as what the main verbs and movement prepositions are. The character 在 (zai) “in, find oneself in, to be in” is introduced, along with the complement of distance in the use of the pseudo existential verb 有 (you) “to have/to be there”. Click here to read our article on the directional complements. In this article we present the topic-comment structure, one of the peculiarities of the Chinese syntax. The topic is the main argument of what we talk about, while the comment is what the topic speaks about. For example: for Chinese books, I go crazy. Click here to read our article on the topic-comment structure. In this article we speak of prepositions that indicate the beneficiary of an action done by another; it speaks of final and causal prepositions; objective prepositions and causative verbs. Click here to read our article on the main prepositions. In this article we explain in detail what it is, how and when you use the particle 了 (le). This particle is one of the greatest obstacles for students of the Chinese language because the Chinese make abundant use of it and at times, unwittingly. Click here to read our article on the particle 了. In this article it speaks about two extensively used adverbs in the Chinese language, 只, 就 and 才. There are many uses for these characters. To be succinct, you can say that the first expresses a certain “facility” in carrying out an action, the second expresses a certain “difficulty and slowness”. Click here to read our article on 只 (zhǐ), 就 (jiu) and 才 (cai). In this article we’ll look at how verbs in Chinese are not conjugated. This doesn’t mean that in Chinese there are no ways to indicate different verb tenses. Chinese uses different arrangements to express the difference in tenses. This article talks about the various aspects that a verb can assume: the completed aspect, in the course of being carried out, the continuation of an action or the state of an action. Click here to read the article on the aspect of the verb. In this article we describe in detail complements of company, means, tools, subjects and also describe how to indicate directions (and also be able to receive them), to get around with ease within the borders of China. Click here to read the article on complements of company, means, tools, subjects and directions. In this article various auxiliary modals in the Chinese language are illustrated in detail, such as “to think”, “to want”, “to have to”, “to hear”. Click here to read our article on auxiliary modals. In this article we talk about interrogative substitutions (who, what, where, when, why) and the structure 以…为. This structure is directly derived from the classic Chinese and is extremely useful for advanced students of Chinese. Click here to read our article on interrogative substitutions and the 以…为 structure. In this article we look at how there’s a particular way to express a determined concept in Chinese by using the same characters: the so-called “doubling”. Here the main types of doubling are illustrated in Chinese: the doubling of classifiers, verbs, and predicative adjectives. Click here to read our article on doublings. In this article it talks about comparatives of greater, less than and equal to. In reality, there’s no actual comparative for less than, because it consists of negating the greater than or equal to comparative. Click here to read the article on comparatives. In this article we illustrate special constructions in the Chinese language, such as those introduced by 如 (ru) “like” and 不如 (buru) “not like”. 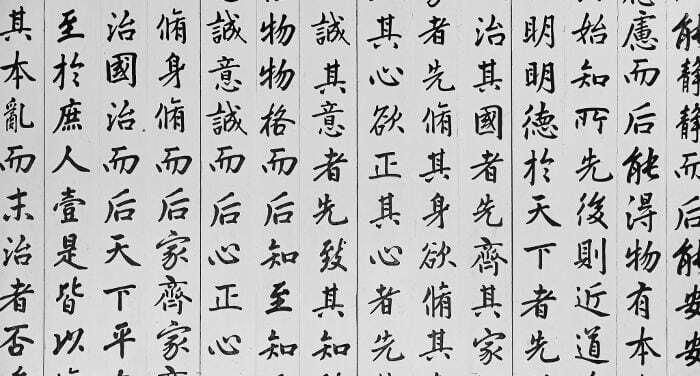 The above-mentioned constructions are directly derived from classic Chinese and are widely used, especially in written form. Click here to read the article on special constructions. In this article we illustrate the main modal particles that are inserted at the end of a phrase to express something in an effective and concise way. This deals with unstressed particles that can express sensations like surprise, but there are others that express the continuation of an action and so on. Click here to read our article on modal particles. In this article we speak about verbal complements that don’t exist in Italian. Lacking a specific term, they are defined as verbal complements because they are placed to the right of the verb to express significant details. Chinese is very photographic, it manages to give incredible details by means of verbal complements. Directional complements and figurative directionals. In this article we talk about constructions with 把 and the origins of this character. This character in classical Chinese means “to take”. In modern Chinese it allows us to change the syntax of the phrase into subject – object – verb, bringing Chinese closer to modern Japanese. Click here to read our article on constructions with 把. This article deals with constructions with 被 and the slight negative aspect that this way of expressing the passive brings. This negative connotation, thanks to the influence of foreign languages (especially English), is gradually being lost. This character carries the meaning of “cover” and “to cover”. Click here to read our article on constructions with 被. In this article we explain in detail the most used conjunctions for connecting two or more phrases: though, nevertheless, since, then, ever since, etc. Click here to read our article on the conjunctions. In this article we illustrate the typical constructions of the Chinese language that allow expression of many meanings in a rapid and really effective way. Click here to read our article on constructions in series. Click here to read our article on rhetorical questions. Lacking a better term, we can call chengyu “idiomatic expressions” of the Chinese language. The chengyu are mainly made up of 4 characters, but it isn’t rare to find a few with 5 or 6 characters. Click here to read our article on chengyu. This article talks about slang in contemporary Chinese. This type of language is increasingly being used, especially by the youth in the language of chatting. Click here to read the article on Chinese slang. As was mentioned at the beginning, the list grows daily. I invite you to leave any questions and/or suggestions in the comments, thanks!